Saturday morning dawned gray and drizzly – the perfect opportunity to visit some of the sights of Memphis that are indoors. 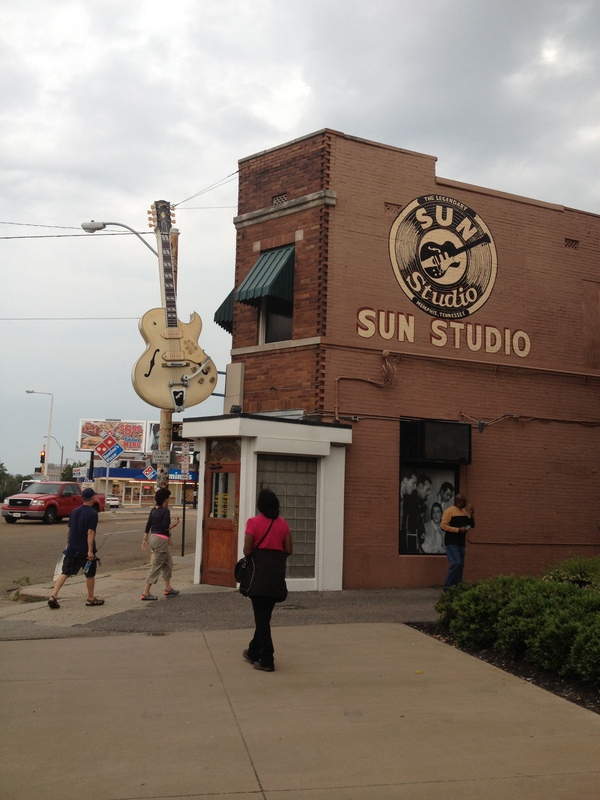 First on the list: the legendary Sun Studios. We headed a few blocks down Union Avenue, where the studio and attached museum sit diagonally, facing Marshall Avenue. With as much music history as this building has seen, I was a little surprised by how small the building was. 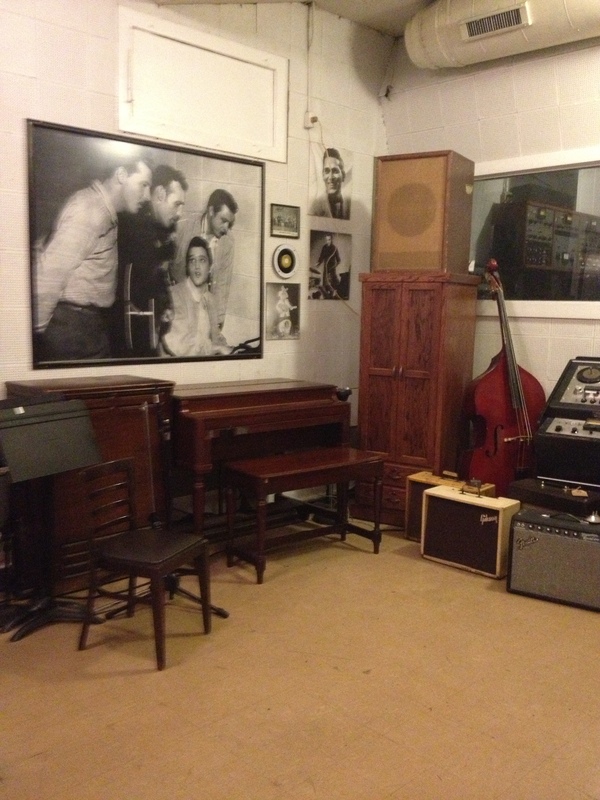 The original studio where Elvis Presley, Jerry Lee Lewis, Johnny Cash, Howlin’ Wolf, Ike Turner, Rufus Thomas and so many more famous musicians recorded consisted of only one small building with an office in the front and the studio in the rear. Years later, when the world came to see the importance of the building to the history of music, the space next door (which used to be a soda shoppe) was also purchased. That two-story building now houses the gift shop (in the space formerly occupied by the soda shoppe – and with real fountain sodas!) on the ground floor and the museum on the second floor. 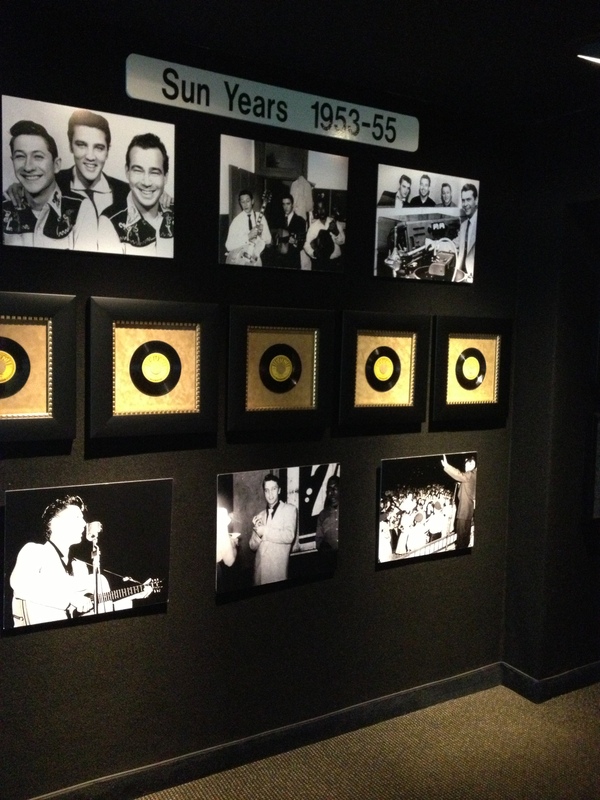 As we learned during our tour of the museum, the picture on the left was referred to as the “million dollar quartet.” As the story goes, Carl Perkins was in town holding a recording session, and Sam Phillips, Sun Studios’ founder and owner, called up a new acquisition of his record label to come sit in on the session. That new acquisition just happened to be Jerry Lee Lewis. As the session stretched on, Elvis Presley, who was in town for the holidays, popped in. Johnny Cash had also wandered into the studio, wanting to hear Carl Perkins’ work. The famous photograph above was snapped, and the sound engineer started rolling tape, capturing forever the legendary jam session of these four amazing musicians. 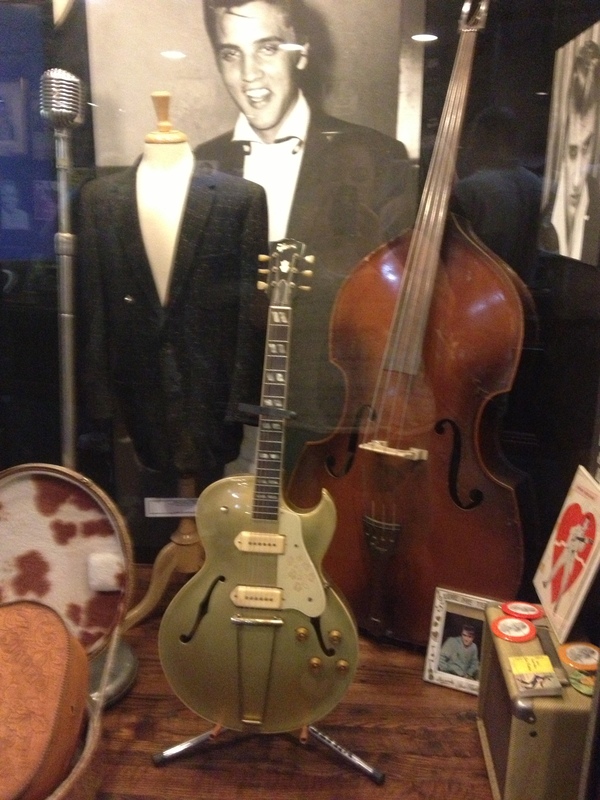 In the museum, we got to see the priceless memorabilia collected by Mr. Phillips over the years, including a guitar used by Elvis in the studio, vintage ads and recording equipment. We also got to hear the true story of the rise of Elvis Presley, which was mostly thanks to the persistence of Sam’s business partner, Marion, who was also his receptionist. 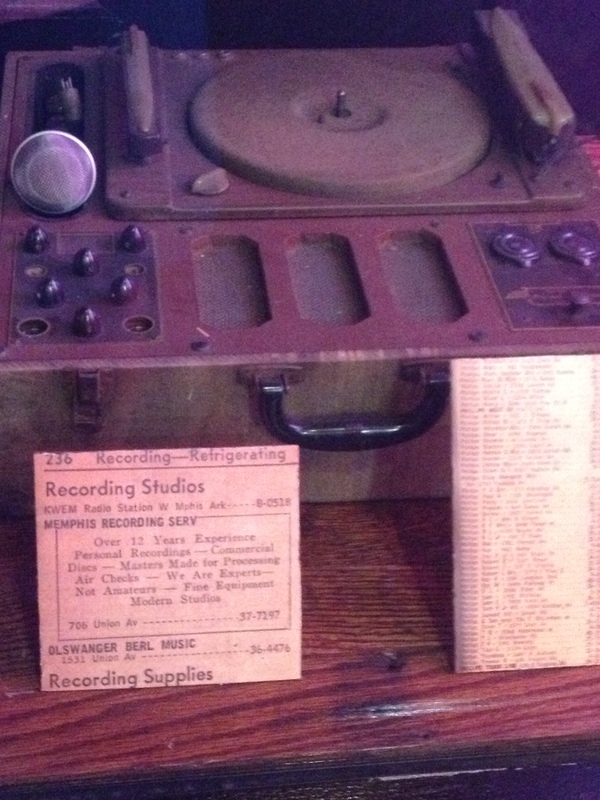 Apparently, when Elvis first came into Sun Studios to record, Marion made a copy of his recording and left it on Sam’s desk. Sam, unfortunately, was not impressed, but Marion was persistent in her support of Elvis, and eventually Sam asked him back to record with some local musicians. During that session, Elvis and the musicians began to jam on Arthur Crudup’s “That’s All Right,” an old blues song. When Elvis and the other musicians started to jump and dance around the room, Sam knew he’d hit on something special. He recorded an acetate, dropped it off to his DJ friend Dewey Phillips, who played it the next night on his radio show, and the rest was history. Once our tour of the museum was complete, we headed back downstairs and next door to the studio itself, where our tour guide showed us exactly where, according to tape marks still on the floor tiles, each of the musicians in that famous recording session had stood, including the gouge in the tile where the upright bass player had propped his bass. She also pointed out the “x” on the floor where Elvis’ microphone stand had been, then she pulled the stand itself out for everyone to gawk over. 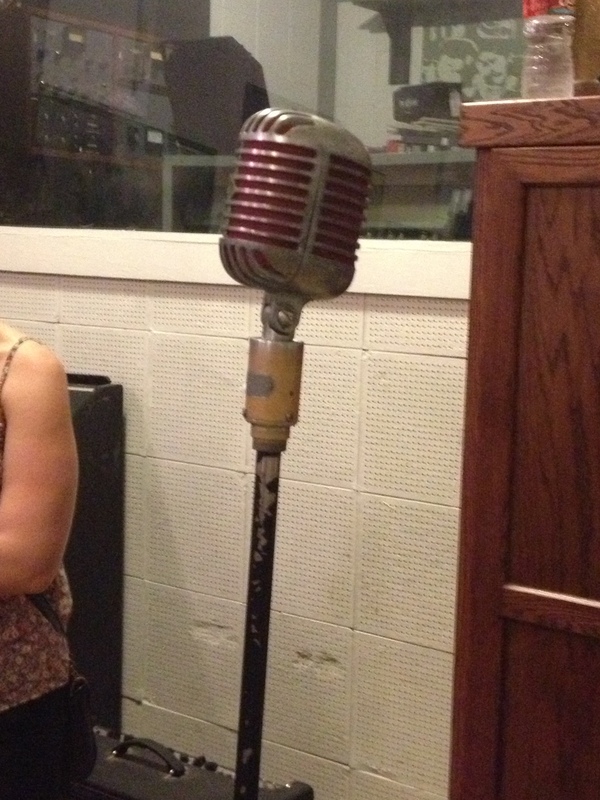 I was amazed that everything in the room is still original to that day back in 1954 – even down to the acoustic tiles on the walls and ceilings that Sam Phillips himself installed. 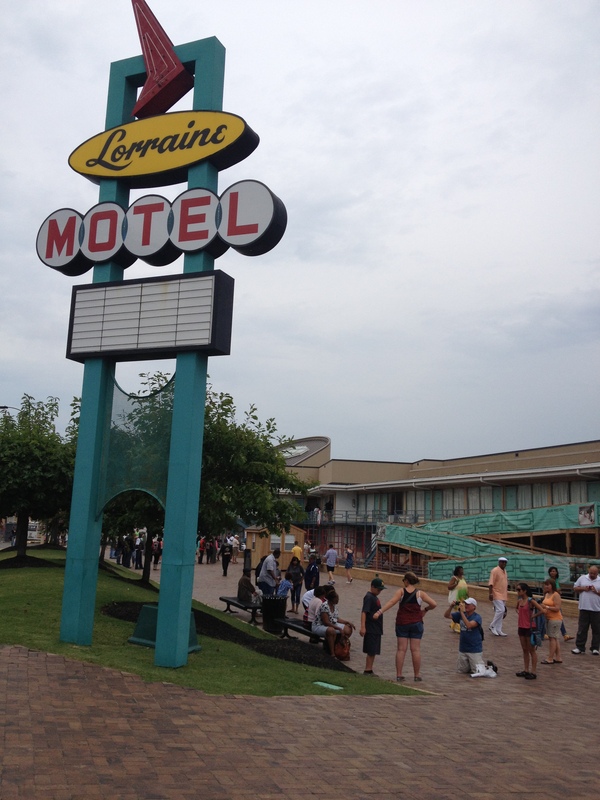 After Sun Studios, we headed across town to the Lorraine Motel and the National Civil Rights Museum. 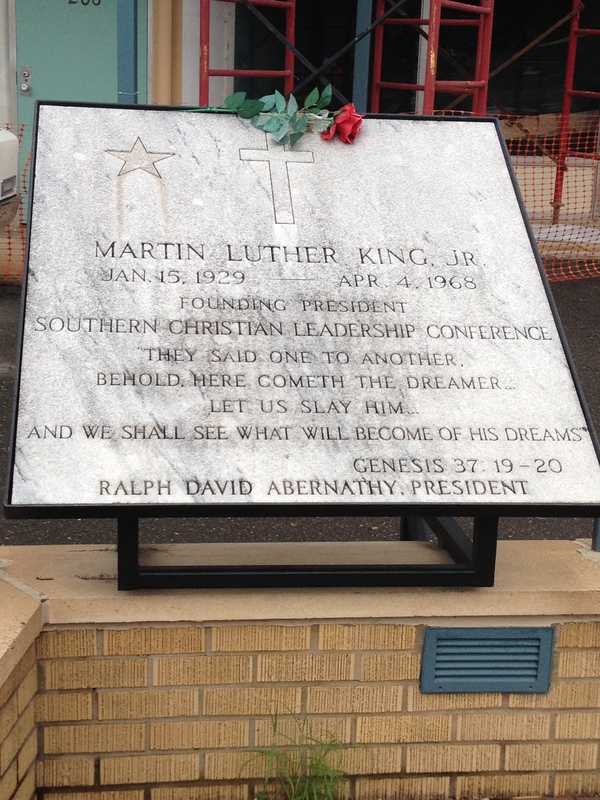 In April of 1968, Reverend Martin Luther King, Jr. was in Memphis to support striking black sanitation workers. 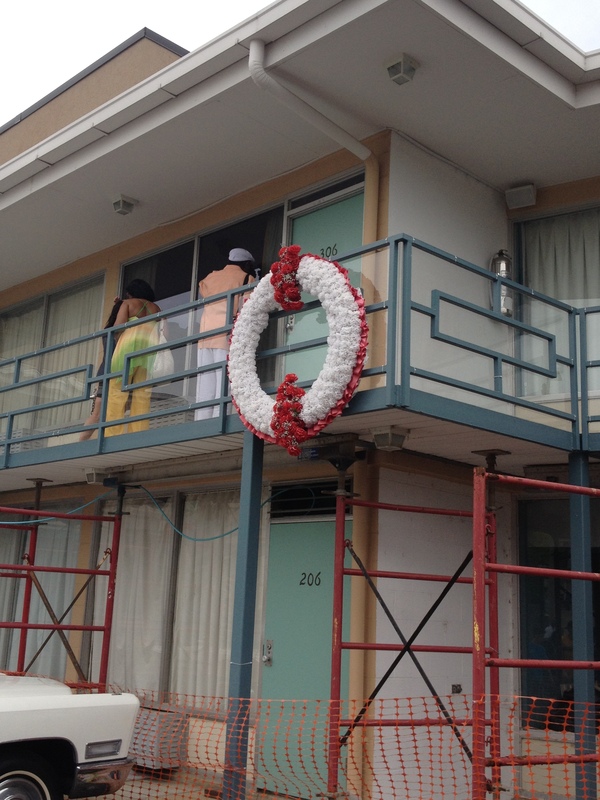 As he stepped out onto the balcony of the Lorraine Motel the evening of April 4, a shot rang out. Dr. King was struck by the bullet and later died at a local hospital. 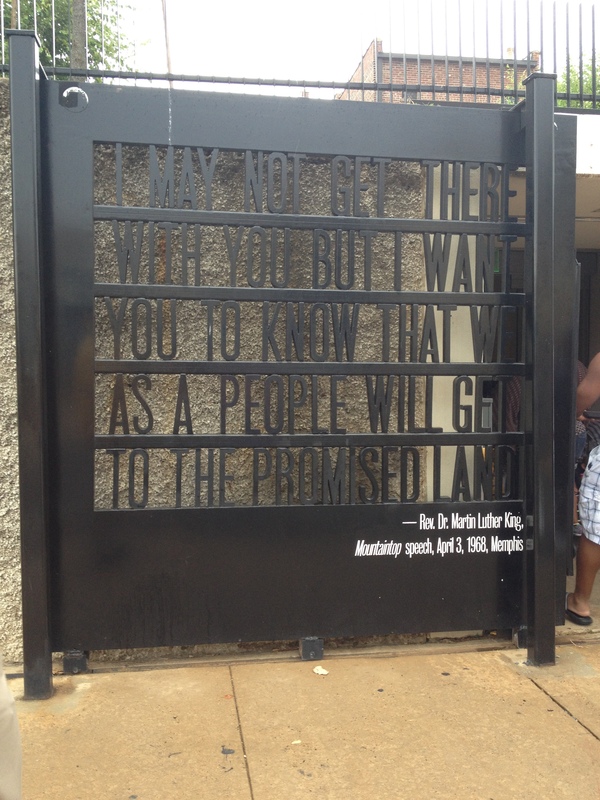 The museum takes visitors through the history of the Civil Rights Movement in the United States, from the earliest days of indentured servitude and the slave trade, to the present day. The timeline of historical events combined with more in-depth information on major accomplishments of the Movement was moving and profound, and really opened my eyes even more to the ways things once were for black Americans in this country. When I try to explain to my son, for example, that hundreds of years ago people were enslaved only because of the color of their skin, or that black Americans could not use the same restrooms or water fountains as whites, I am at a loss for words. My son’s school is very diverse, and he has friends from every ethnic and religious group you could imagine, so I think it is hard for him to understand how different American society used to be. I, too, have trouble wrapping my head around the treatment black Americans received at the hands of racist whites. To see how hard-fought a struggle the Civil Rights Movement has been – how difficult it must have been to remain peaceful and focused when so much hatred and bigotry was against you – gives me so much appreciation for the work of Dr. King and so many others. 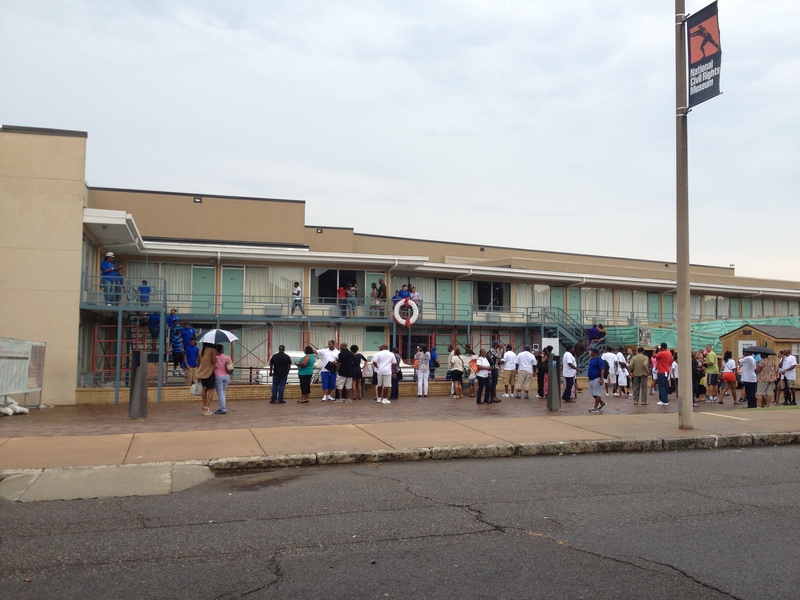 The capstone to our visit was the “balcony experience” – the ability to mount the steps of the Lorraine Motel and see the room Dr. King stayed in and the balcony where he was killed. There is nothing that can prepare you for such an experience. It was very emotional, and I could feel the weight of the importance of the site as I climbed the steps. The gray skies made the few moments I spent on the balcony even more somber. 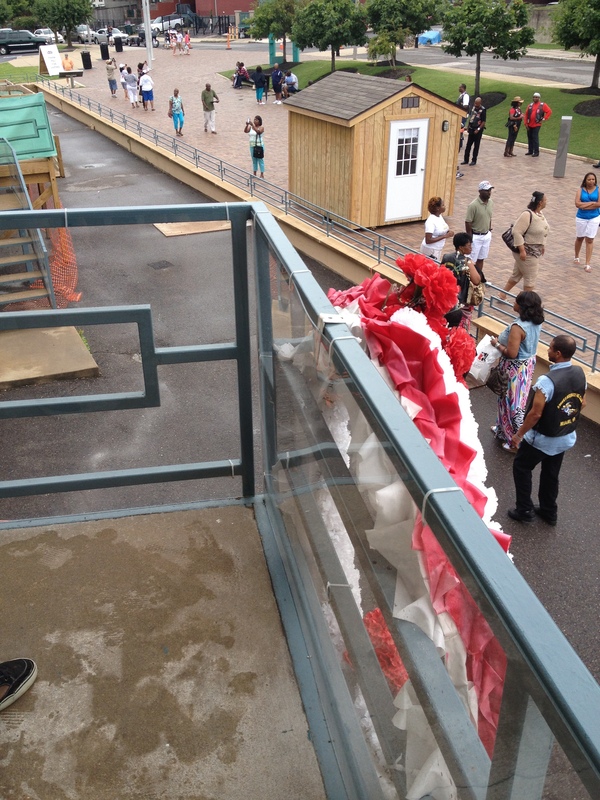 The balcony is a place for reflection on Dr. King’s life, and on how far we have come as a nation towards his vision of equality, and yet how far we still have to go. After our visit to the National Civil Rights Museum, my husband and I were starving, so it was quite convenient that Central BBQ was located directly behind the Lorraine Motel. 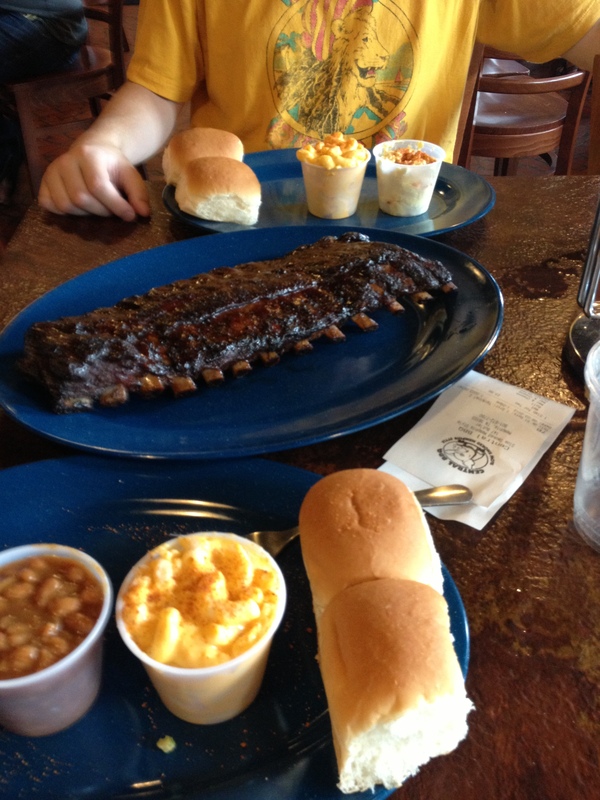 We headed inside and made our way to the order window, where we picked the full slab of ribs for two – wet – which came with two sides apiece, as well as two rolls each. We both picked macaroni and cheese and barbecue baked beans for our sides. The ribs were delicious – rich, smoky flavor and just the right amount of sweet, spicy sauce. And the sides were hot, fresh and had that home-cooked flavor. We also tried a local beer that was on special. After lunch, we headed back to the hotel to chill out in the pool for a bit, then drove over to the Beale Street Landing to board a Memphis Riverboat cruise down the Mississippi River. 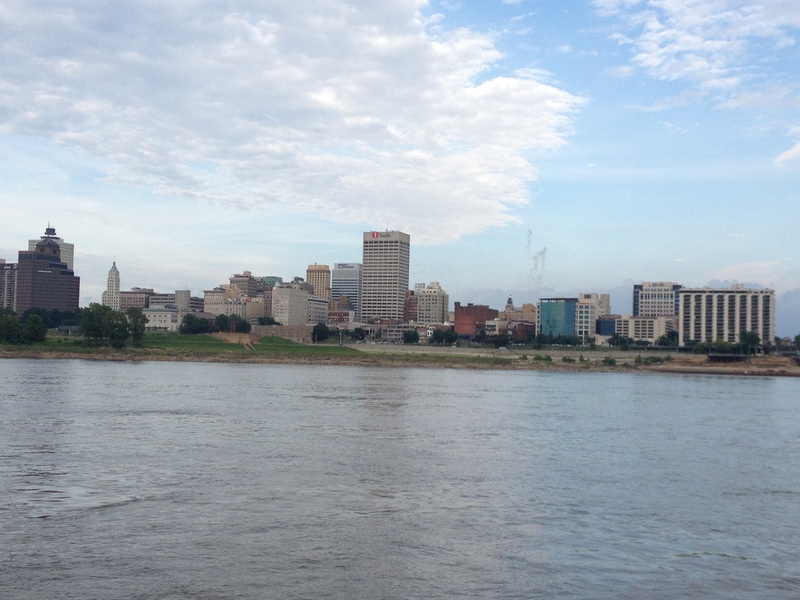 The cruise was about two hours long, and had commentary on the history of Memphis and a few funny stories from the city’s past, such as the story of Hopefield, Arkansas. According to our guide, in the early 1900’s, Hopefield had become a den of vice. 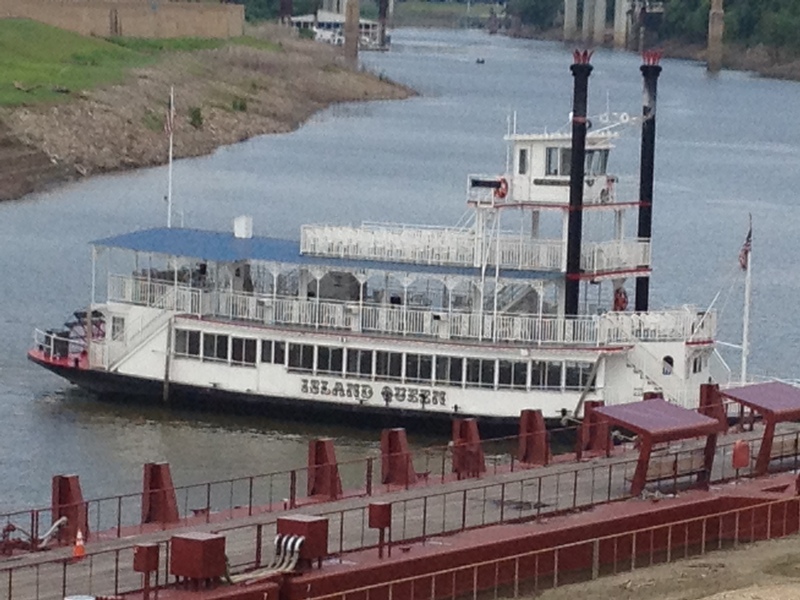 Gambling and prostitution were common there, and since it was right across the river from Memphis, many men from the city would cross the river on boats to take part in these illicit activities. Some of the women of Memphis, tired of their husbands staying across the river at all hours of the day and night, contacted the Memphis police department, who organized a “rescue” party to cross the river and encourage these men to return home to their wives. When they arrived on the Arkansas side of the Mississippi, they found the men waiting for them, guns drawn. The men ordered the Memphis police to strip naked, then put them back into their boats and sent them back across the way they’d come. 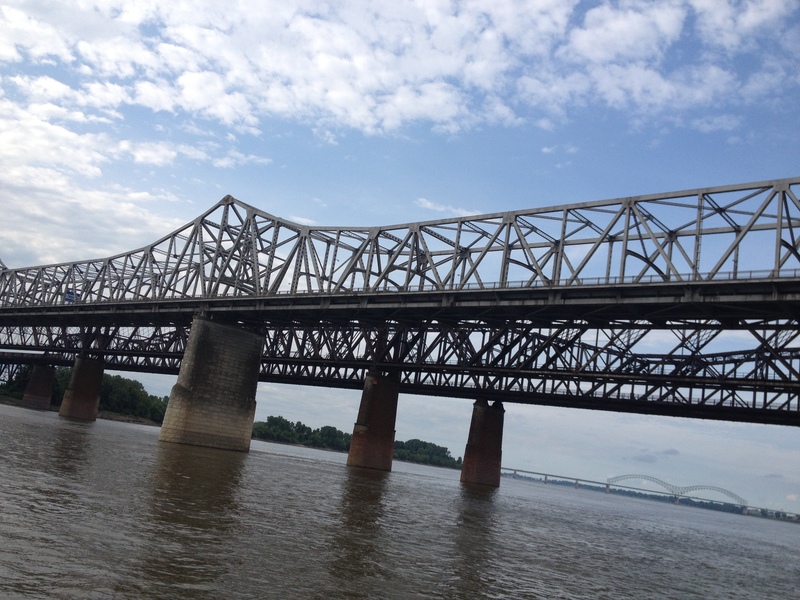 When the boats returned to the Memphis side of the river, the staid ladies on the shore were in for a surprise, as the naked police officers stepped out of their boats, embarrassed, and explained that there wasn’t anything more to be done. At that point, the women of Memphis turned to prayer, which apparently worked out better for them in the end, as the town of Hopefield was swallowed up by the Mississippi River in 1912 after massive flooding. We also learned about the time in 1812 when the river flowed backwards following a massive earthquake that made a crevice in the riverbed so large that the water had to flow backwards up the river to fill it in. That evening, my husband and I were kind of “barbecued out” (I know that sounds impossible), so we decided to have dinner at a sushi and Thai restaurant near our hotel, Bangkok Alley. Our dinner was light and delicious, and we walked back to our hotel, where I spent the rest of the evening reading about the history of Memphis, especially relating to music. That information would come in handy for Sunday’s activities! 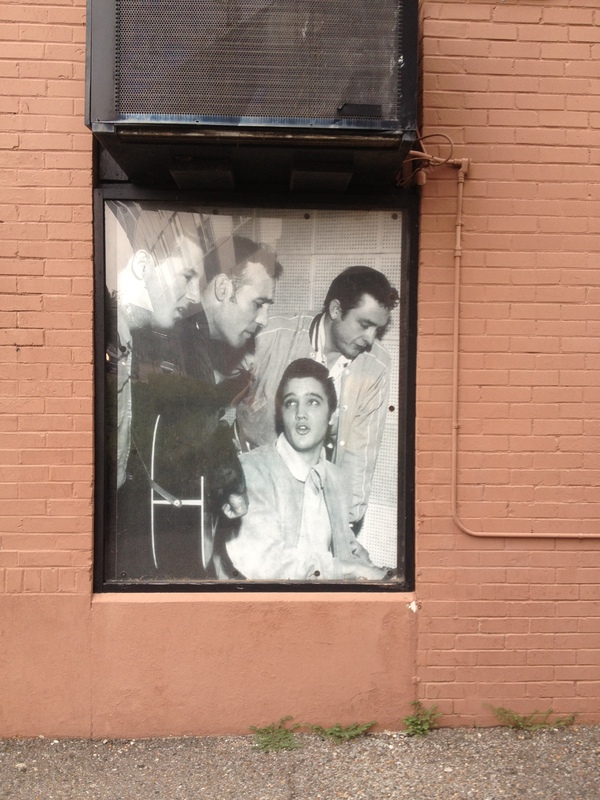 “I saw the ghost of Elvis on Union Avenue. As the National Pork Board‘s “Pork Passion Pursuits” sweepstakes winner, my mission in Memphis was to soak up the local culture and to learn about the prevalence of pork barbecue in this city by the Mississippi River. Friday morning, my husband and I had a quick breakfast at our hotel, then set out to explore the city. We drove to the South side of town to check out an old, abandoned brewery from the late 1800’s that sits on the bluff high atop the river, then we walked down to the riverside to check out the view of the city. After our quick trip down to the river, we headed for Graceland. In the classic movie “Pulp Fiction,” Uma Thurman’s Mia Wallace tells John Travolta’s Vincent Vega “For instance, there are only two kinds of people in the world, Beatles people and Elvis people. Now Beatles people can like Elvis and Elvis people can like the Beatles, but nobody likes them both equally. Somewhere you have to make a choice. And that choice tells you who you are.” My husband and I are polar opposites in many ways, so it should come as no surprise that, while I’m a die-hard Beatles person, he, on the other hand, is a self-professed Elvis person. 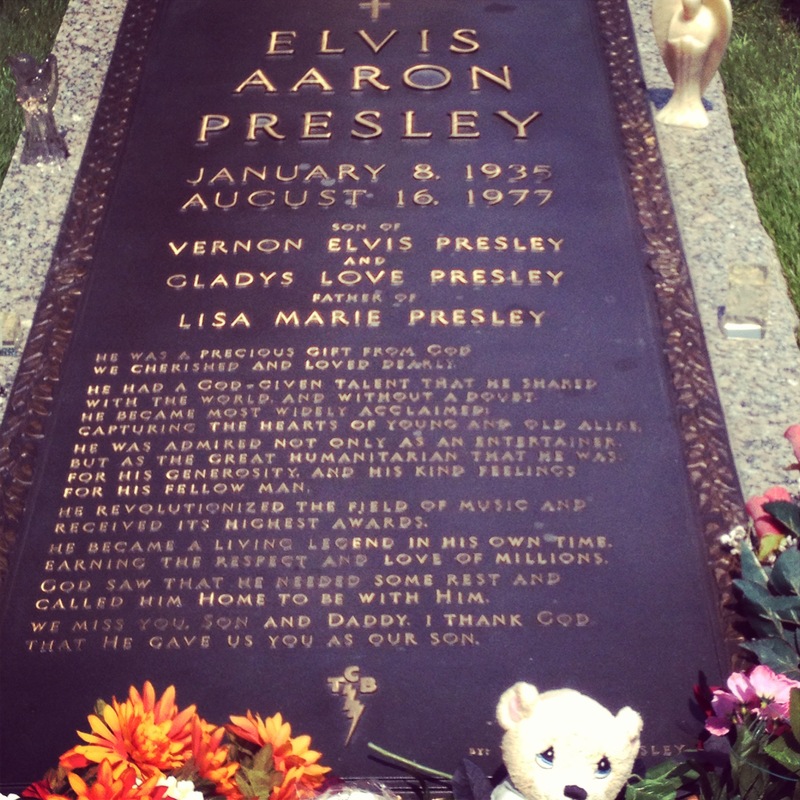 Our trip to Graceland was one of the things he was most looking forward to on our trip. 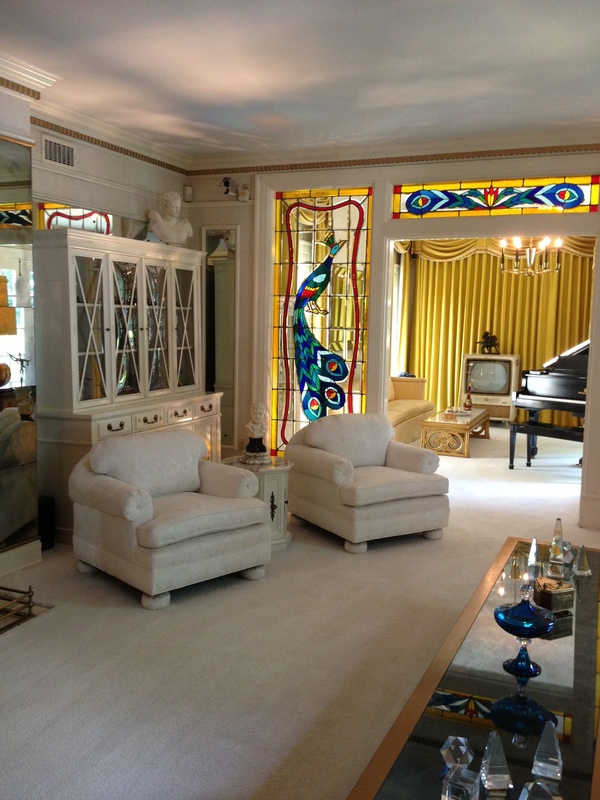 The first thing I noticed about Elvis’ home was that it is definitely big business. There’s a fee to park in the huge lot adjacent to the ticketing/exhibit complex, and each of the exhibits exited, predictably, through a gift shop. The home itself is across Elvis Presley Boulevard from the ticketing/exhibit complex, and a shuttle bus ferries visitors back and forth. I was surprised at how small the house was – I guess I’d always assumed that Elvis – you know, the King – would have a massive home, but it’s really more of a large home than a mansion. Of course, coming from poverty like he did, I’m sure the house was enormous to Elvis and his family. I also had not been aware that Graceland was an historic home built in the 1930’s, and that Elvis bought it rather than having a house built. 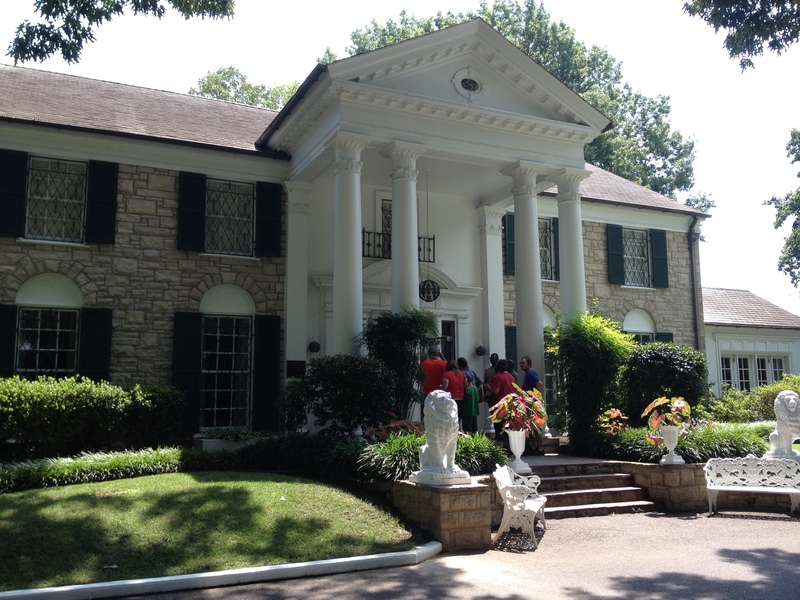 The home is in remarkable shape, and has been preserved just as it was when Elvis passed away in 1977. In fact, the house is so well-preserved that you can almost imagine the man himself rounding the top of the steps and coming down to greet you. 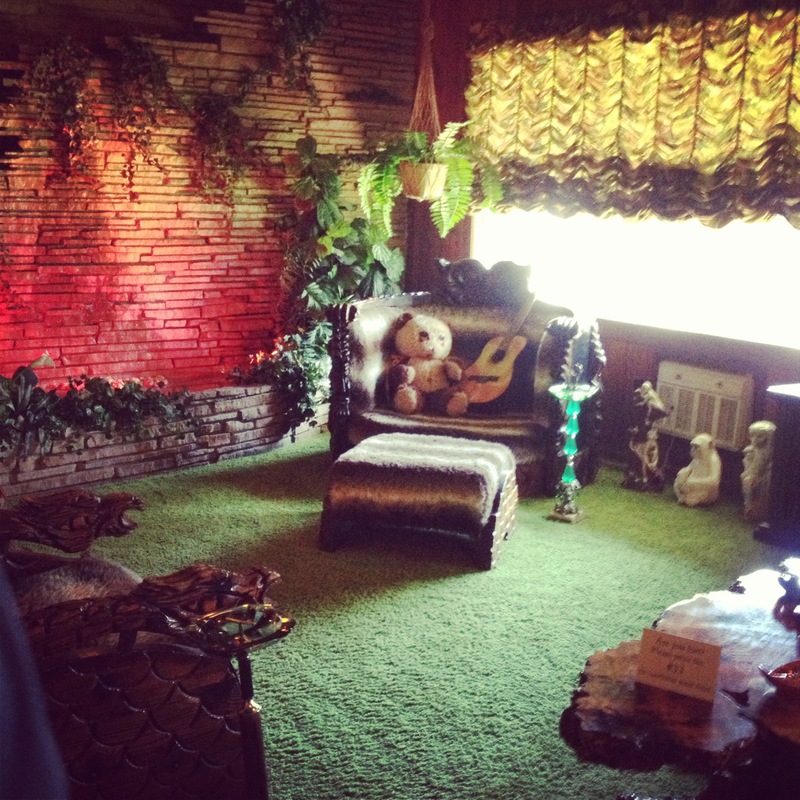 The decor is decidedly seventies and just a bit tacky, especially in the areas of the house where Elvis spent most of his time, such as his basement tv and pool rooms and the infamous Jungle Room. 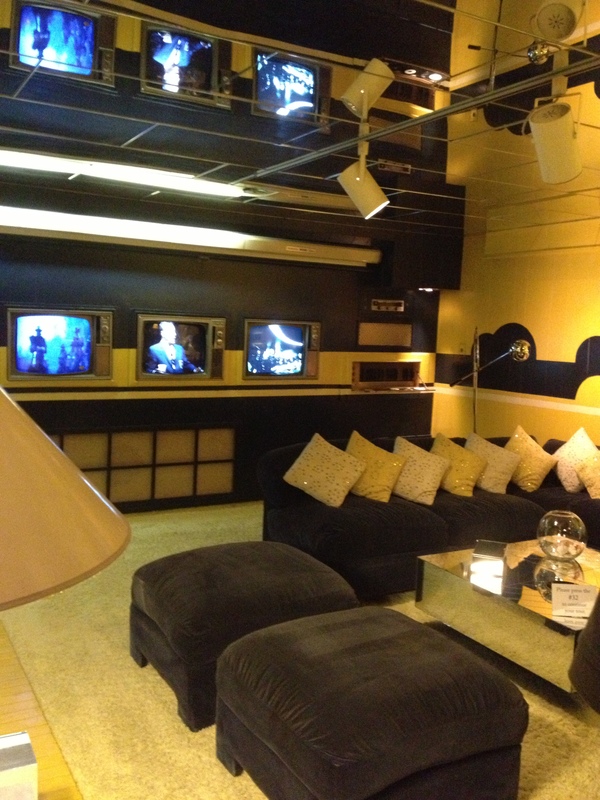 Despite the initial gaudiness, however, you soon realize that everything at Graceland was completely state-of-the-art when Elvis was alive, down to the triple tv’s in his tv room. After we crossed back over Elvis Presley Boulevard in the shuttle bus, we were free to visit the other exhibits included in our Premium ticket: Elvis’ Automobile Museum, his private planes and a small exhibit chronicling his run in Las Vegas. 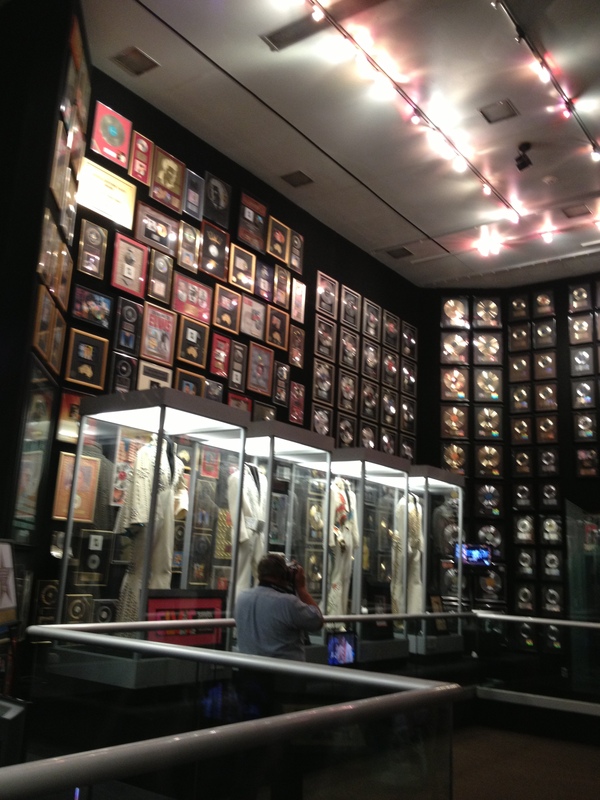 My husband is a gearhead, so he loved the chance to see some cars and motorcycles from Elvis’ collection. 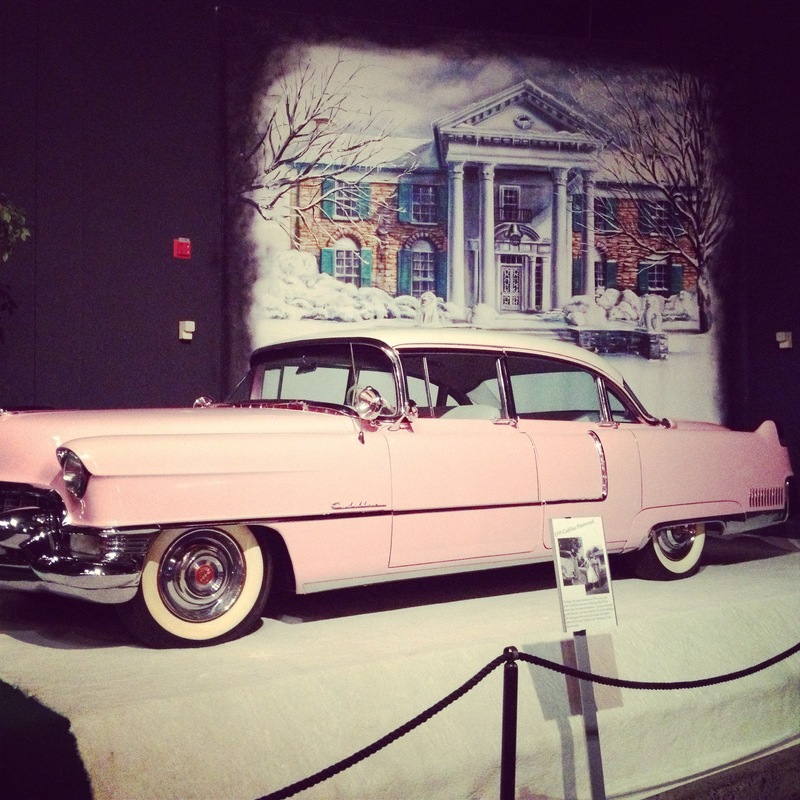 The pink Cadillac he bought for his mother was the star attraction. 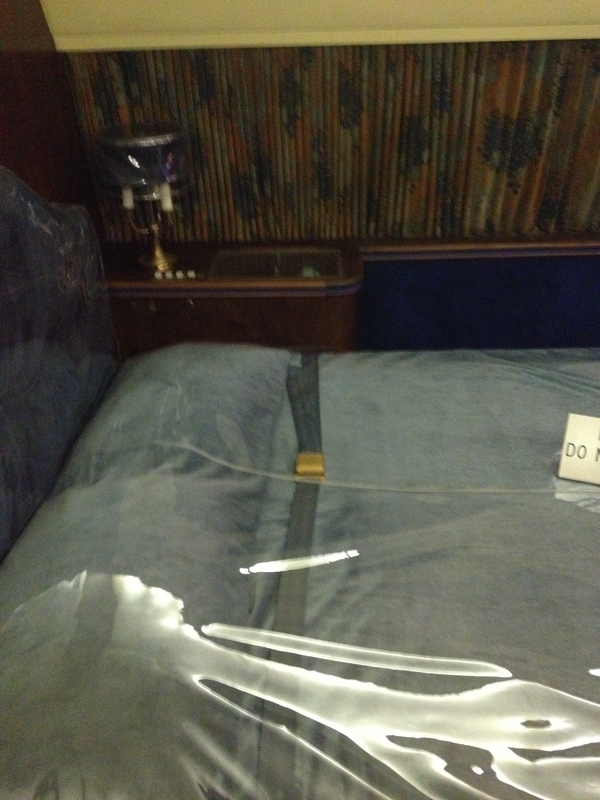 The planes were cool too, especially Elvis’ custom jet plane with his very own bed, outfitted in blue suede sheets – of course! After we finished visiting all the different exhibits and gift shops, my husband and I were starving. What better place to stop for lunch than the barbecue restaurant down the street that The King himself used to frequent? We made our way to Marlowe’s Ribs & Restaurant and settled into a weathered booth. Like Graceland itself, Marlowe’s appears to be stuck in the 70’s. 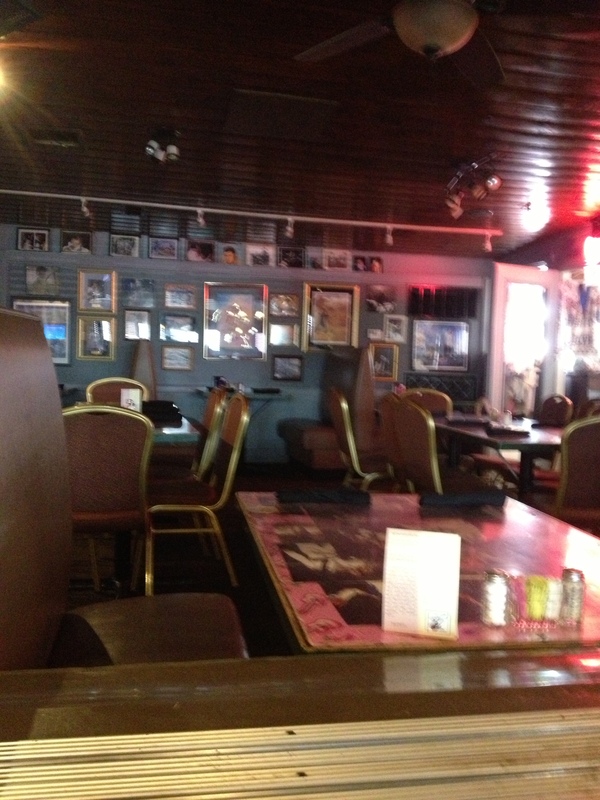 The decor is vintage, and the walls are covered in Elvis memorabilia, articles and photos. As with every barbecue joint in Memphis, Marlowe’s has a gift shop where it sells its own dry rub and bottled barbecue sauce. We both got the pulled pork sandwich, which came with cole slaw and fries. One bite and I could tell why Marlowe’s pulled pork has won award after award – the meat was perfectly smoked and sauced, and it was thick and juicy. I was in pork heaven! After such a huge meal, we headed back to the hotel for a rest, and to check out our plans for the next few days. Our hotel, the Hampton Inn Beale Street, had an indoor pool and hot tub, so we hung out there for awhile before deciding to head to Mud Island Park for a run. 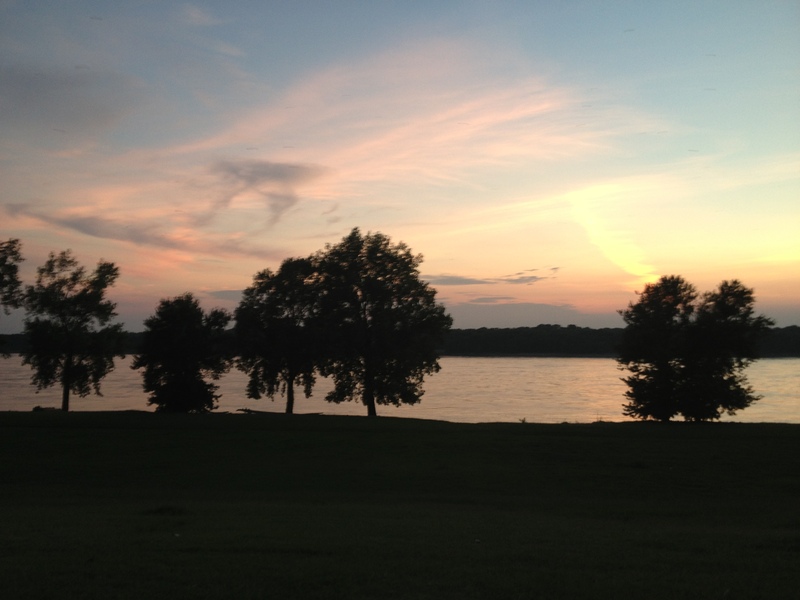 The park runs alongside the Mississippi River, and the views of the river are gorgeous, not to mention the views of the massive and stylish homes that line the bluff atop the river. 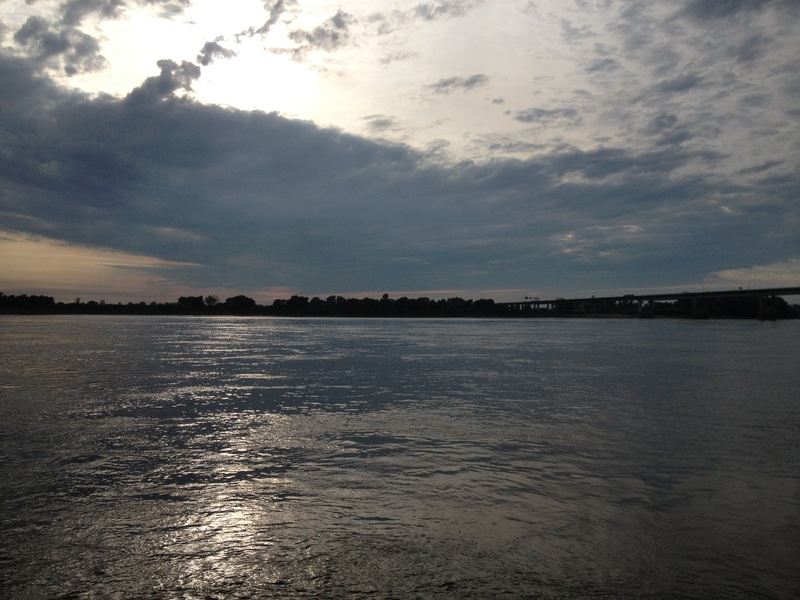 We jogged along, watching the sun set over the Mississippi, then headed to grab a quick dinner of salads from Arby’s. All the traveling, walking and jogging must have done us in, because we ended up tucking in early on Friday, ready for a busy Saturday in Memphis! “Put on my blue suede shoes and I boarded the plane. 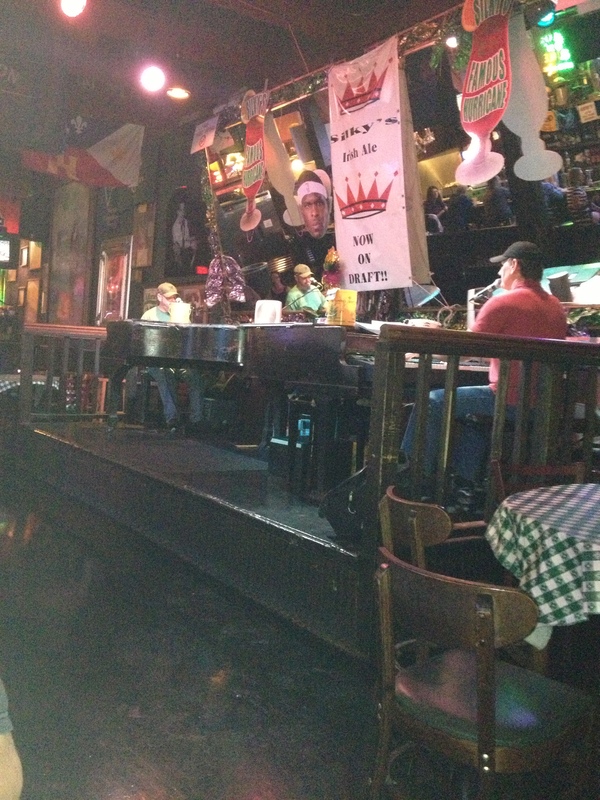 My husband and I were starving after our flight, so we headed for Beale Street. We could hear music as soon as we stepped out of the hotel, and we turned the corner and found ourselves in the middle of this historic entertainment district. 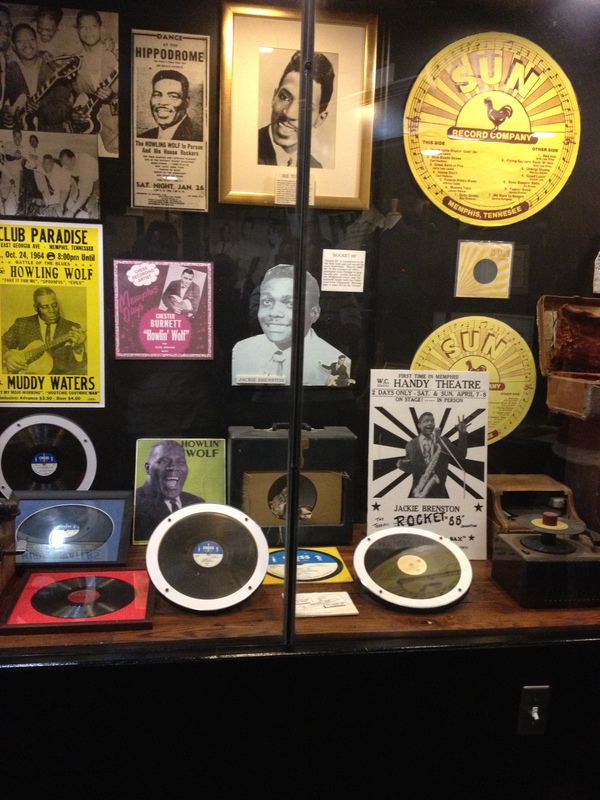 From the late 1800’s to today, Beale has a storied past as the birthplace of the blues, but it was also home to the first black millionaire in the United States, Robert Church, in the 1880’s. Mr. Church paid the city to create Church Park, at the corner of 4th and Beale Streets, which later became a haven for musicians from the farms and plantations of the Mississippi Delta who came to the city to perform, including W.C. Handy, Robert Johnson, Rufus Thomas, Muddy Waters, Howlin’ Wolf, and a female blues singer from nearby Walls, Mississippi, “Memphis Minnie.” I was somewhat disappointed to find that the street has largely been commercialized, with a Hard Rock Cafe now standing where Pee Wee Saloon, a meeting place for local blues artists in the early 1900’s, once did. One of the remnants of Beale’s heyday is dry goods store turned souvenir shop A. Schwab, which even has a museum dedicated to the history of the shop. As soon as we stepped onto the sidewalk of Beale Street, the unmistakable aroma of smoking meat filled the air. We followed our noses down the block to Blues City Cafe, where a mister spritzed us with a cool spray of water as we opened the door. The restaurant is open and spacious, and its corner location, with big windows on each side, lets in lots of natural light. But the smell is the best part of Blues City Cafe (besides the food itself, of course!). 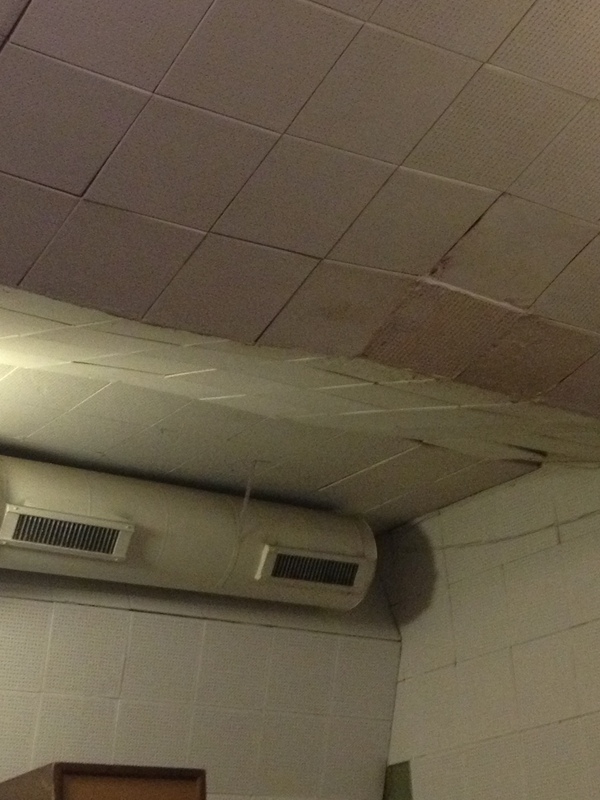 The smokers are along a side wall, and that section of the restaurant, behind a long bar, has been decorated to resemble an old-school barbecue shack, complete with tin roof. The yummy-smelling scent of smoking, cooking meat fills the room and all I could think about was ordering up and devouring a big plate of ribs! The menu is relatively small – only the front and back of one laminated page – but we quickly found what we’d come for. 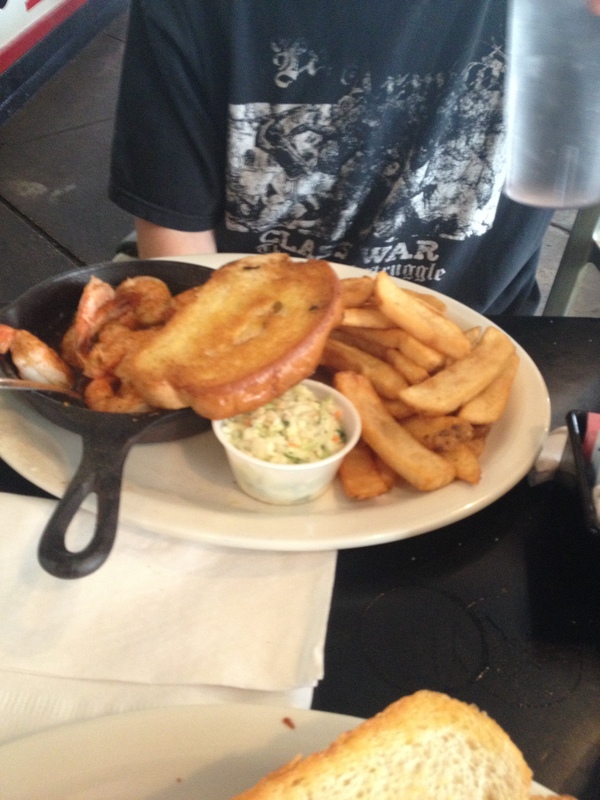 I ordered a half slab of ribs, which is served with cole slaw, baked beans, fries and Texas toast, while my husband had the skillet shrimp – a dozen fresh shrimp baked in a sizzling skillet of butter and Cajun spices, served with the same sides as the ribs. Our food came out shortly, and I was in heaven! The ribs were delectable – so tender they were falling off the bone. All I had to do was flake the meat off with my fork and it fell apart on my plate. There was practically no fat, as it had all absorbed into the meat itself and left the ribs juicy and full of smoky flavor. I ordered them wet, and the sauce was perfect – not too thick and just the right sweet, spicy flavor. My husband’s shrimp were amazing too (I made him share!). The spice mixture they were cooked in was full of spicy Cajun flavor and they soaked up the butter from the skillet. The front desk clerk at the hotel had advised me to save some room for an apple dumpling, and I’m glad I did! 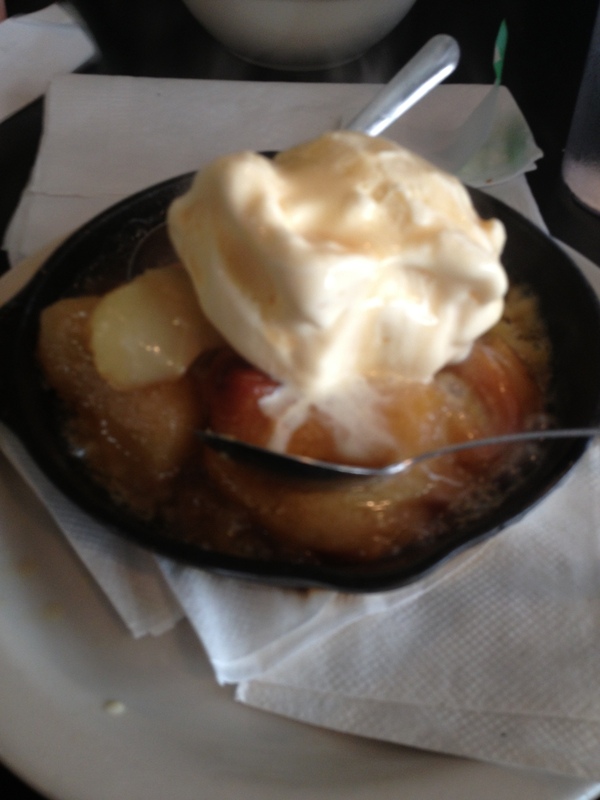 Our dessert was served sizzling hot in an iron skillet, with tender apples and fried batter topped with vanilla ice cream. It was so simple, and so delicious! Overall, I give Blues City Cafe five stars for delicious, perfectly-cooked barbecue, a delicious dessert, a cool vibe and great staff. 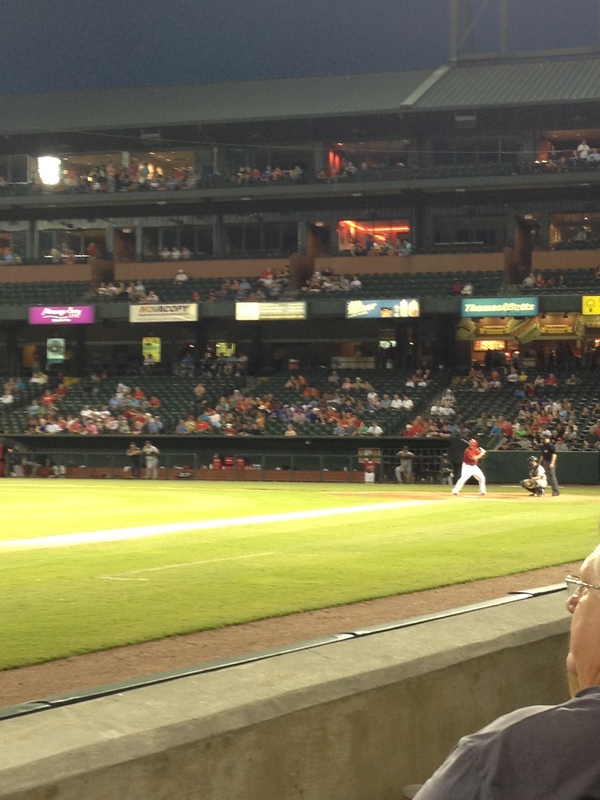 After our meal, we headed back to the hotel and noticed that Autozone Park was crowded – there was a baseball game that night. We walked the few blocks to the stadium (I told you the Hampton Inn Beale Street is centrally-located) and headed inside, where we got to watch the St. Louis Cardinals’ AAA affiliate, the Memphis Redbirds, take on the Tucson Padres. Our first day in the city was filled with barbecue, beer, baseball and music on Beale Street! Winning the Pork Board’s “Pork Passion Pursuits” Sweepstakes! Anyone who knows me knows I’m an avid sweepstakes enterer (if that’s even a word!). In a typical week, I enter 150 to 200 different online sweepstakes, and I’ve won trips, cash, shopping sprees and all kinds of other things (makeup, hair and skin products, video games and systems, etc.). Yes, I get lucky sometimes, but I also put in the time to enter a LOT of contests. A few months back, I came across the National Pork Board’s “Pork Passion Pursuits” sweepstakes – a contest offering a $5,000 prize to winners in each of five different categories to fulfill their pork passion dreams. 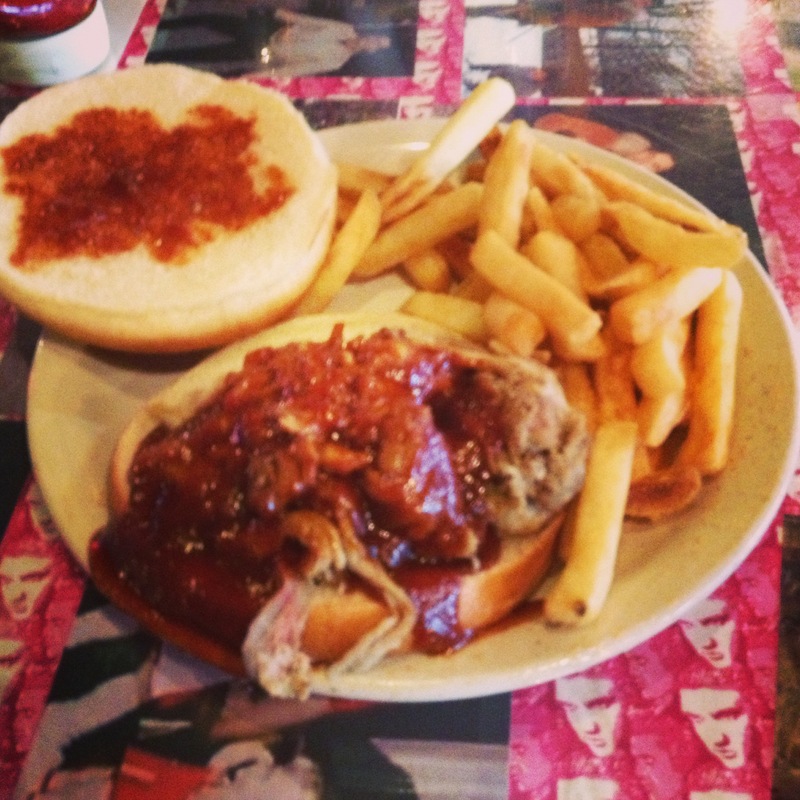 I’d been hearing the song “Walkin’ in Memphis” a lot, so I typed out a quick entry in the Lifestyler category mentioning how much I love Memphis-style barbecue and the fact that I blog about food history and would love to learn about the history of this delicious style of pork barbecue. I promptly forgot about my entry until about a month later, when I received an email from a marketing and PR firm stating that I had won the Lifestyler category, and would be presented with a $5,000 prize to carry out my pork adventure! The first emotion I felt was shock, of course, but once the excitement set in I quickly set to work planning my trip to Memphis. I visited the websites of the Food Network, Cooking Channel and local bloggers in the Memphis area to discover which barbecue restaurants were the best. I began researching the history of Memphis-style barbecue: the combination of spicy dry rub and sweet, thick sauce that is just irresistible. My research led me through centuries of food history. The area comprising and surrounding the present city of Memphis was inhabited first by the Chickasaw tribe, a group of mound builders who were part of the larger Mississippian culture. In the mid-1500’s, Spanish explorer Hernando de Soto navigated the Mississippi and surrounding rivers and tributaries and discovered the settlement on the bluff that is now the city of Memphis. It is known that when de Soto landed in Florida, he had with him a herd of pigs. It is likely that some of those pigs were brought with him as he traveled up the Mississippi River, and that some may have escaped into the wild. In 1540, close to present-day Tupelo, Mississippi, the Chicksaw tribe, in the presence of explorer Hernando de Soto, cooked a feast of pork over the barbacoa. This was the very first “Memphis barbecue!” In the early Colonial days, settlers hunted pigs and other native game in the woods and wilds surrounding their settlements. The pig was an important food source for settlers, as pigs could be domesticated easily, but could also be released back into the wild should food sources become scarce, then hunted and even re-domesticated later, when food stores were greater. The method of slow-cooking meat over hot coals and green wood seems to have originated with native peoples, and the name “barbecoa,” which later became barbecue, comes from that practice (from “The History of Barbecue in the South“). Southerners quickly picked up the practice, using it to cook the abundant pig population to the point that they eventually ate an average of five pounds of pork for every one pound of cattle. From colonial times up to the antebellum period and beyond, “barbecues” were popular social functions, taking place at community gatherings and political rallies throughout the South. 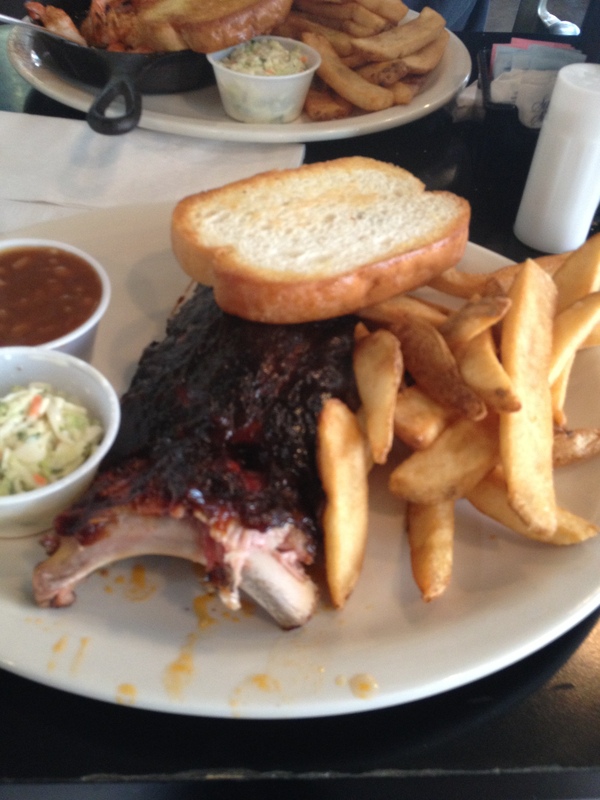 In Memphis, one of the staples of the barbecue scene is the slab of pork ribs. The cooking of ribs, and much of the process of slow cooking pork over low heat, most likely originated from slaves and, post-Civil War, poor blacks having access only to less-desirable cuts of meat, and thus needing to cook it “low and slow” to tenderize it. 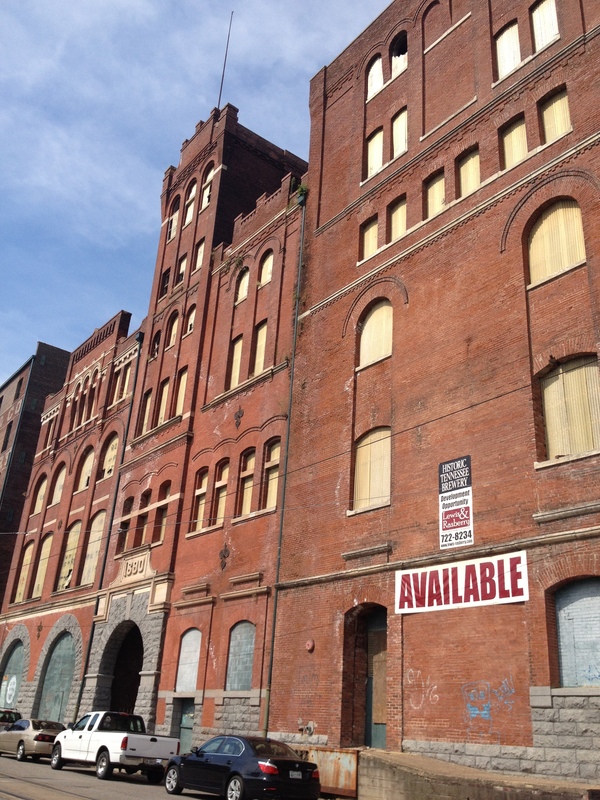 In Memphis, the proximity to the Mississippi River and the city’s status as a port and trading hub allowed residents access to imported products, such as spices and molasses. The textbook Memphis style of barbecue – spicy dry rubbed meat cooked low and slow, then sauced with a thick, sweet sauce – likely developed over many years, and each major barbecue restaurant in town has its own blend of dry rub and sauce. The spice blends are almost always based in paprika, and the sauces are rich with tomato flavor, vinegar and molasses. There are a number of iconic barbecue restaurants in Memphis, and I added them to my list of “must-visit” places. Over the next few posts, I’ll introduce you to them, and recap my trip. My husband and I had such a great time, and I’m so happy that the National Pork Board chose me to have this experience. I really feel like I got to live out my “Pork Passion Pursuit” in Memphis, and I learned so much about barbecue, the blues and the history of this delicious style of barbecue. Stay tuned for more!